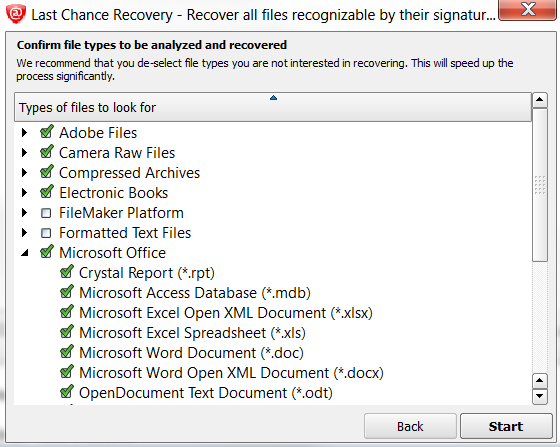 This recovery method is helpful when primary recovery methods (QuickScan and SuperScan) either haven't detected your files and folders, or hundreds of volumes are being detected and you cannot locate or recover your files from them. This recovery method tries to detect all un-fragmented files based on their standard signatures. In most cases we will be able to detect and properly recover the contents of lost files. However we won't be able to detect the file system attributes (eg. original filename, creation date, modification date etc). Detected and recovered files will be grouped by file extension only, and will have abstract file names. The File Organizing feature will help you to group your files into folders based on extended file attributes (available for some file types). For example, songs may be grouped by artist and or album, and photo images may be grouped by camera and the date the photo was taken.